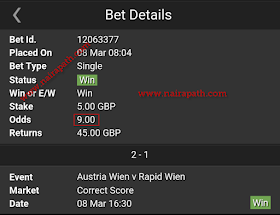 So you meet this guy Online – facebook, whatsapp…You also see pictures of his won fixed matches and you finally taught you found the right Source. He gives you a match that will make you lose more money and then Blocks you! 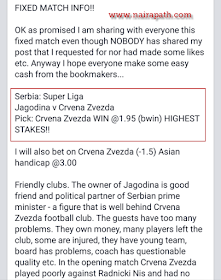 This is the latest scam happening online for those seeking to Win Big through Fixed Matches, but this article is going to look at what it means to be dealing with fixed matches and how it plays a role in sports betting. The more knowledge, the more power to the player. 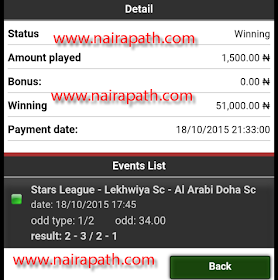 Most people will only participate simply because of the payouts which are usually a large sum. I was on the bench at times, and telling players what to do, giving orders to the coach. It was that easy. There was no policing whatsoever.” He added. So for the question; does match fixing exist in football? Of course it does and anyone who tells you it doesn’t is naive. There are still possibilities for you to make large sums of money from it. Don’t be a victim of many internet Fraudsters claiming to always have fixed matches as it is a very hard thing to come by. Most Bad Sources could be based on Normal predictions and might get lucky. They might win the predictions but that will happen only once in a while. 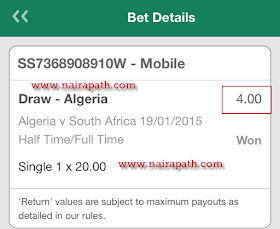 Algeria during the 2015 African cup of Nation was very good and playing against South Africa would be a difficult one to win easily, so I backed them on a bet to Draw at half time and win by Full time and it worked just as predicted. 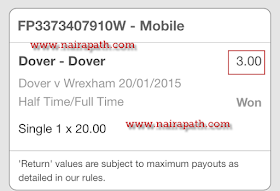 Another good prediction here as Dover FC was in very good Form against wrexham their opponent and i predicted after doing my homework that Dover will win Both Halves of the Games at a 3 odd and it worked perfectly. 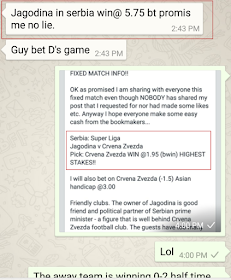 NOTE; this kind of bets isn’t based on match-fixing. 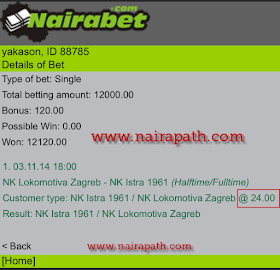 It’s based on research and knowledge once you become an expert in Football betting. Someone once sent me something saying Liverpool vsSevilla was fixed… I mean seriously? A Europa League CUP FINAL. Remember more than one player has to be bribed to get a fixed match to work, especially on things like correct scores and half time/full time markets. They usually have a Facebook profile and their own website, possibly even a forum. They use these tools to gain your interest and sell you a “fixed match” but match-fixing scams are essentially a pyramid scheme. The scammer gets 9 buyers (A-I). They tell Buyer A it’s going to be 2/1, Buyer B is told 1/2, Buyer C is told x/1, Buyer D is told x/2, and so on. The match plays 1/2: the half-time score was Liverpool 1, Sevilla 0; and at full-time Liverpool 1, Sevilla2. Buyer B (and probably many others) received the prediction of 1/2. 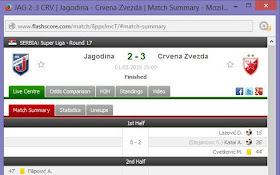 They will be very happy, they supposedly won the fixed match. The scammer then raises the price of the tip for the next “fixed” match to those who won. Buyer B will buy at least two more matches from the scammer before giving up, especially if they’re new and naive. As for the losers, the scammer will ditch buyers who didn’t win, taking their money and vanishing. Maybe he would give them his next predictions for free in hopes of getting lucky and convincing them again. And that’s how you will lose and lose more of your hard earned money while the only winner here will be the scam artist. Always examine claims of a fixed game by keeping some basic questions in mind. How big are the clubs involved? How are the bookmakers responding? In our example, Liverpool and Sevilla are both large clubs. They make vast amounts of legitimate money and are unlikely to get entangled in match-fixing. While fixed matches do occur in smaller markets where games are played at a lower level, bookmakers impose hard betting caps in order to limit their liability when a team wins. In fact I have had some connections with some and have realized the real sources give the sure to win games and they don’t provide these matches often because it is not easy to fix a Match. 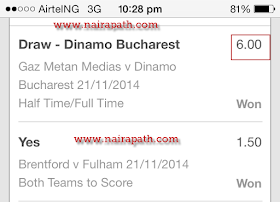 Looking at the above images you can notice the games are mainly from France Ligue 2, Romania, Czech and Qatar. You should examine the source you find on the internet as some would just give false information on matches they have little crew about. Getting good information about fixed matches is all about who you know. If you know a handful of good people, rely on them. Remember, be confident with your money and where you spend it. Any signs of weaknesses are bad. Having emotional ties to the things or teams you’re betting on is not good, considering you could be dropping big bucks on a team that isn’t winning simply because you are a fan. And most importantly, manage your money well. Don’t just waste it on Scammers!